Note : the "Cravens" experiment is for a planned demonstration. In May 2013 the results of a "Third Party" test were presented as an arxiv.org paper. A summary is at Forbes. The credentials of the investigators are also considered here. Unlike previous eCat models which heated water, producing steam, the "Hot Cat" was evaluated on its own, producing heat by radiation and by convection. November 2012. 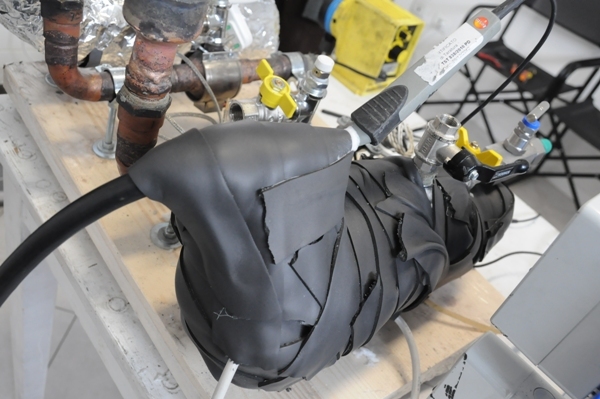 A test was started with a new "Hot Cat (HT)", but the eCat "ran away" -- "The performance of this device was such that the reactor was destroyed, melting the internal steel cylinder and the surrounding ceramic layers. " In all cases the output energy was calculated based on the radiation emitted by the device, and the calculated thermal convection. The AC input power was measured with an appropriate wide-band meter. They did not report that they checked the DC component of the input power, but subsequent statements by one of the authors says that they did. They didn't use their own cable between the Rossi-supplied power socket and Rossi's controller, so some forms of "wire fake" might theoretically be possible. The investigators were not allowed to see the "magic powder" (they were allowed to see its container), or to examine the waveforms on the wires between Rossi's controller and the eCat. Neither of these affect the calorimetric results. There was a "Wiring Fake" -- either by special wires, or by a large DC component. The investigators are co-conspirators with Rossi and the whole experiment must be ignored. The rest of my analysis assumes the results are true. I will use the energy densities based on the volume of the eCat's components. The result shows that with even a highly implausible fake (the entire visible cylinder consists of Boron, which burns with external air) the eCat ran over 500 times longer than the fake. The "Domestic" eCat is undergoing certification at an undisclosed laboratory, and NO new information will be provided until the certification is complete. The original 1MW "warm" Ecat has been certified for industrial use. (No details have been provided). The first 1MW Ecat has been installed at an undisclosed military location. A second 1MW will be shipped shortly to an undisclosed customer. The third will be delivered to a customer in "North Italy" in about 3 months. The name of the customer will be disclosed, and it may be possible for "qualified" people to visit it, by appointment. At this conference Rossi released a preliminary report on the hot eCat. At almost the same time one of his licensees issued a brief report that they had failed to validate the "hot" eCat. Ian Bryce of the Australian Skeptics Society has proposed a new "Wiring" fake, which could account for some of the experiments. This is described in the "Hidden Wires" section. A clamp ampere meter was used to measure the current fed to the whole system as well as the current feeding the electrical resistance. The difference was found to be insignificant at all times. The electrical connection was made through a residual-current device to make sure that no current was fed through the ground cable. These eliminate any possibility of the Bryce fake in those experiments. 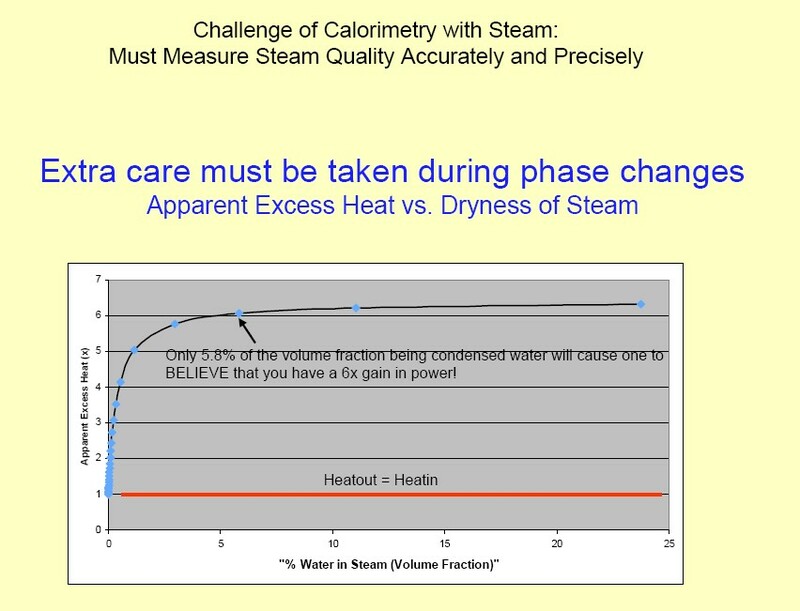 Significant questions have been raised about the steam calorimetry used in these experiments, particularly by Steven B. Krivit, addressing the question of "Steam Quality", which can vary from "0% Dry" (the output is composed entirely of liquid water) to "100% Dry" (the output is composed entirely of water vapour). My analysis, however, indicates that very low steam quality is unlikely. (See http://lenr.qumbu.com for links to my latest versions). In any event, not all fakes could be excluded even assuming high steam quality (95% Dry), so the conclusions of this paper are not significantly changed, and I have not updated it to reflect different estimates of the excess power produced. 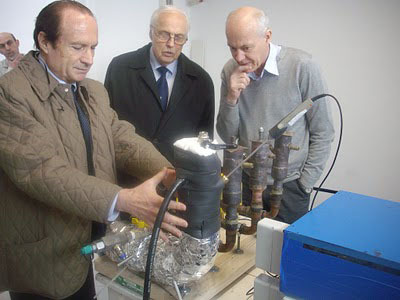 A new "Cold Fusion" device was demonstrated at the University of Bologna, Italy on Jan 15, 2011. Unlike the Pons and Fleischmann setup, which uses Palladium and Deuterium and can take months to perform an experiment, the Rossi/Focardi eCAT uses Hydrogen and Nickel, produces large amounts of power (more than 10kW), and can be turned on and off on command. Several experiments have been performed : One in December 2010 by a panel of independent scientists (led by prof Levi), one in January 2011, attended by the same scientists and invited press, and one in February 2011 attended only by Levi, and for which a formal report has not been issued. An experiment was conducted in March 2011, by Kullander and Essén. 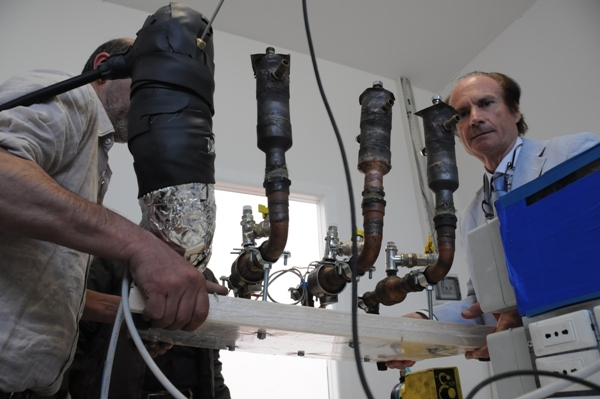 Two experiments were conducted by Mats Lewan in April. This paper attempts to prove that the Rossi/Focardi device is real, by ruling out all known fakes. For any particular fake the total energy and run-time is computed, assuming that the ENTIRE unknown volume is occupied by the fake material, and that its conversion to heat energy is 100% efficient. If the fake could run LONGER than the experiment, then it is NOT eliminated. If the fake would run out of fuel before the end of the experiment, then the fake is eliminated. If ALL known fakes are eliminated, then the device must be real. The December/January experiments were too short to rule out ANY of these theoretical fakes. But if Levi's informal reports on the February trial are accepted, then ALL chemical fakes are eliminated. However, neither the January or February reports rule out a Tarallo Water Diversion Fake. The March report probably rules out a Tarallo fake -- but since the Horizontal arm was NOT unwrapped, it does NOT rule out all chemical fakes. Two new tests were run in April. These definitely rule out a Tarallo fake. 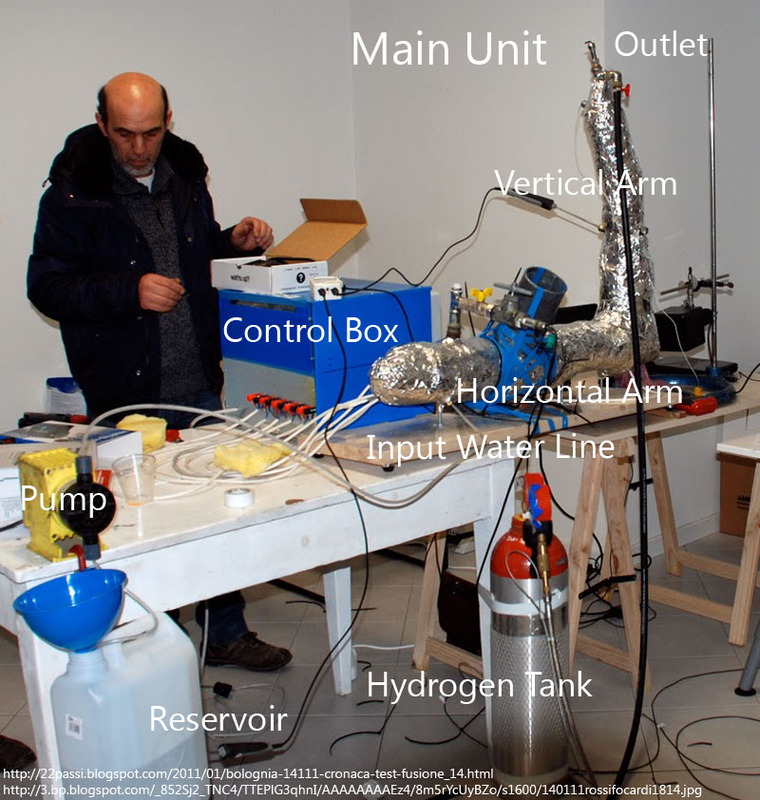 The experimental setup was adequate, but since the eCat was NOT unwrapped the time of the run was NOT long enough to rule out ANY of the chemical fakes. (Only some of the stored-heat fakes are eliminated). At present EVERY known fake has been eliminated by at least ONE of the experiments, but the Rossi eCat has NOT been proven to be real by any ONE experiment. Some will argue that this means it's real, while others will argue that it could still be fake. It must, however be noted that Rossi made the "Calorimetric Black Box" eCAT available without any restrictions (other than the use of radioactive spectral detectors), so the lack of proof is due to defects in the observers instruments or techniques, not due to his attempt to conceal anything. An Italian patent has been issued : Patent granted for the energy catalyzer. World-wide and US patents are reportedly still being pursued. A third test was performed by Kullander and Essén Experimental test of a mini-Rossi device at the Leonardocorp, Bologna 29 March 2011 and Swedish physicists on the E-cat: “It’s a nuclear reaction”. 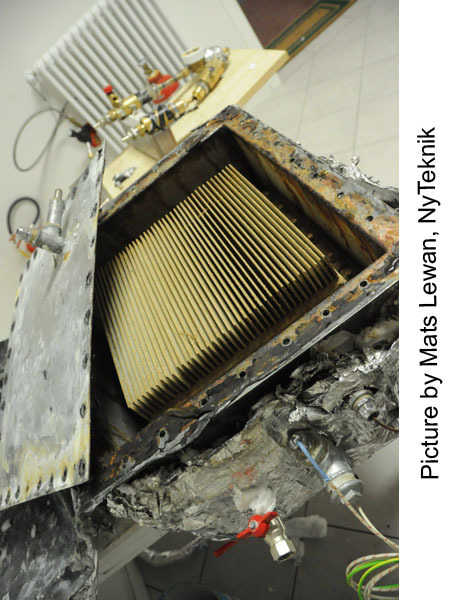 Ny Teknik tested the energy catalyzer in April 2011. It currently appears unlikely that any further demonstrations will be performed before October 2011. An Italian TV program, RaiNews24, witnessed some of the tests: The Magic of Mr. Rossi (dubbed in English). Cold fusion was first announced by Pons and Fleischmann in 1989, and was rapidly "debunked". But contrary to popular (and mainstream scientific) opinion, Cold Fusion was never actually disproved (see the history section.) Work has continued in a variety of private, university and government studies, with an annual ICCF conference, now in its 17th year. Most of the work has concentrated on the Pons and Fleischmann setup, which uses Palladium and Deuterium. It has been replicated hundreds of times, though experiments can take months to run, and require sophisticated calorimetry. In contrast, the Rossi/Focardi eCAT uses Hydrogen and Nickel, produces large amounts of power (more than 10kW), and can be turned on and off on command. Rossi plans to install a 1MW water-heating plant, made by connecting 300 4 kW devices in series and parallel, in Athens, Greece, in October 2011. A greek company, Defkalion Green Technologies S.A. has world-wide rights (excluding the Americas), and is building a factory for the production of 10 kW domestic units, possibly as early as November 2011. An Italian patent has been issued : Patent granted for the energy catalyzer -- although it is not clear whether this is honored in the rest of the EU. World-wide and US patents are reportedly still being pursued. All of these eCAT demonstrations were primarily a "black box" calorimetry experiment. Because his patent application has not yet been approved, Rossi declines to make detailed comments on the process, or to let anyone see inside his "reactor chamber". The duration of the tests would be directly proportional to the mass and volume of unknown origin. For the present set-up a convincing evidence would include a power production of (order of) 10 kW sustained for weeks in a controlled and monitorized environment. For these we attempt to put numbers to that philosophy, by calculating UPPER BOUNDS on what any known chemical process could produce. This kind of fake can run for an unlimited time, and could therefore run longer than a chemical fake. They can only be eliminated by more stringent inspections and experimental setups. The Tarallo Water Diversion fake is the most plausible of these. This kind of fake would pass all of the black-box tests and all possible external inspections. They therefore represent alternative implementations and, if true, would be as great a breakthrough in science as the Rossi eCat. If it's not real, how can the experiment be faked? And if it's faked, how can we detect it, or eliminate it? “It is an old maxim of mine that when you have excluded the impossible, whatever remains, however improbable, must be the truth. If all possible fakes are eliminated then the eCat must be real -- even though we do not know how it works. If current science can't explain it, then the science is wrong. Cold fusion was first announced by Pons and Fleischmann in 1989, and was rapidly "debunked". But contrary to popular (and mainstream scientific) opinion, Cold Fusion was never actually disproved. Cravens And Letts (The Enabling Criteria of Electrochemical Heat: Beyond Reasonable Doubt) performed a statistical analysis of 167 papers, and identified 4 criteria which were satisfied in all successful experiments (including Pons and Fleischmann's original paper), and in which one or more were omitted in failed experiments -- including all the original "Debunking" papers. The most important are Lewis (Caltech) -- where NONE of these criteria were met, and Williams (Harwell), in which only ONE was met. These two papers effectively removed Cold Fusion from main stream science (and funding). Cravens And Letts point out that although ignoring these criteria almost guarantees failure, following them improves, but does not ensure success. Alchemists were well advised to include the "eye of newt" in their potions, since they did not understand which of the many steps were critical to success, and which were irrelevant. Perhaps those alchemists used better science than Lewis and Williams. Also see Krivit: How Can Cold Fusion Be Real, Considering It Was Disproved By Several Well-Respected Labs In 1989? Work has continued in a variety of private, university and government studies (Experiments), with an annual ICCF conference, now in its 17th year. Hundreds of papers have been written, some in peer-reviewed mainstream journals. (Library). Most of the work has concentrated on the Pons and Fleischmann setup, which uses Palladium and Deuterium. It has been replicated hundreds of times. However, it has not reached 100% reproducibility. Experiments take months to "load" the deuterium into the palladium (though recent experiments with co-depositing deuterium and palladium eliminate this step), and are not guaranteed to work. (Though a set of cathodes which work in one experiment will almost always work in a different set-up). They require very subtle calorimetry over a long period, which introduces doubt into the results. In addition to the calorimetric results, a 'CR-39' polycarbonate detector (long used by the Russians) placed next to the electrode shows clear evidence of high-energy particles (Mossier-Boss et al : Use of CR-39 in Pd/D co-deposition experiments and Reply to a comment .. by Kowalski). The first reported work using Nickel and Hydrogen was by Francesco Piantelli (See articles by Krivit: Deuterium and Palladium Not Required and Piantelli-Focardi Publication and Replication Path ). The Rossi/Focardi eCat uses Hydrogen and Nickel, produces large amounts of energy (more than 10kW), and can be turned on and off on command. Image from Levi report (December 2010?). It seems that the two experiments used slightly different eCATs -- April 19 used the March setup, and April 28 used a version with a truncated chimney. The new "fatcat" no longer has a Tube boiler. Instead, a "wafer" containing up to three "cores" sits in a simple kettle, discharging water or steam through an outlet in its lid. The "fat eCat is in the background. The heat exchanger is in the right-foreground. The Ecat with its lid removed, showing the top heat exchanger. Heat exchanger -- heats and/or boils the water. Control Unit powered from an AC wall-plug. Compressed Hydrogen bottle, weighed before and after. The entire Horizontal and Vertical arms were enveloped in tinfoil for the December/January trials. The presence or absence of any evidence of nuclear activity is NOT considered in this paper. Apply 1 kW through the control panel until the reactor "ignites"
In December 2010 a team of scientists was allowed to examine the device, and performed a number of experiments. In January 2011 a "press" demonstration was held -- though the reactor developed an internal problem (reportedly on the leads to an internal heating resistor), took a long time to "ignite", and ran at lower efficiency (higher input power). These two will be referred to as the "January" apparatus and experiment. (These could be confirmed from the photographs). The basic observable elements are an horizontal metallic tube (approximate length 70 cm, diameter 20 cm, 22 l volume, 30 kg weight as a guess-estimate) as the reaction chamber, a vertical tube for steam output (50 cm length, 15 cm diameter, 9 l volume), a control system box (approx 40x40x40 cm3 dimensions, 64 l volume, unknown weight), a water pump and an hydrogen bottle. Prudentially I have lifted the control box in search for any other eventually hidden cable and found none. The weight of the control box was of few Kg. Whether any air was taken in by the device, or combustion products released. Given the rate of flow, the output power (kW) was calculated, and the INPUT power (kW) to the controller was subtracted. Hydrogen: less than 0.1 g of hydrogen was consumed. At the press conference Rossi announced that they have a working system providing heating in their own plant (presumably with multiple eCATS), and that he plans to install a 1MW Plant in Athens, Greece in October, 2011. The February trial reportedly had the same general structure, except that is was only used to HEAT water, not to convert it to steam. The primary observer of the February run, Prof Levi, was allowed to examine everything EXCLUDING the reactor chamber, which he estimated to be about 1 liter in volume. He reported that a lot of the volume of the horizontal and vertical arms was insulation, and that lead shielding was visible around the reactor chamber. The Control Unit and all parts of the Main Unit excluding the reactor were inspected. The VOLUME of the whole REACTOR. Flow Rate: 3,000 L/h = ~833 ml/s. Hydrogen: less than 0.4 g of hydrogen was consumed. Note : Levi has not released a report of this experiment, and Rossi has declined to comment on it. This paper uses Rothwell's numbers. Our plants of 1 MW are made with series and parallels of 10 kW modules. Our 10 kW modules have been tested from 2 years and we have a deep knowledge of them. If the temperature or the pressure inside the apparatus goes critic we cut the hydrogen supply and cool down the E-Cat increasing the flow of water as much as necessary. Consider that we do not use radioactive materials and we do not produce rad waste, that a single module has a volume of about 1 liter and is very easy to cool down with water. Every module is controlled indipendently from the others and if one module has to be stopped the others can work. Through a live interview with NyTeknik Rossi answered a number of questions : E-cat inventor in live chat with the readers (+ Video Interview) and And here are 36 more questions – with Rossi's answers -- though many of these were not technical in nature. There is some evidence that the Hydrogen/Nickel reaction can become self-sustaining, so the ratio of output to input electrical power would become infinite. Rossi has stated that NO experimental results will be published for at least a year. A new test has been released, with pictures of a smaller 5kW device with and without shielding and insulation. “In some way a new kind of physics is taking place. It’s enigmatic, but probably no new laws of nature are involved. We believe it is possible to explain the process with known laws of nature,” said Hanno Essén, associate professor of theoretical physics and a lecturer at the Swedish Royal Institute of Technology and chairman of the Swedish Skeptics Society. The new trial was conducted in much the same way as the trial in January, and lasted for nearly six hours. According to observations by Kullander and Essén, a total energy of about 25 kWh was generated. Experimental test of a mini-Rossi device at the Leonardocorp, Bologna 29 March 2011. Participants: Giuseppe Levi, David Bianchini, Carlo Leonardi, Hanno Essén, Sven Kullander, Andrea Rossi, Sergio Focardi. Travel report by Hanno Essén and Sven Kullander, 3 April 2011. Any chemical process for producing 25 kWh from any fuel in a 50 cm3 container can be ruled out. The only alternative explanation is that there is some kind of a nuclear process that gives rise to the measured energy production. 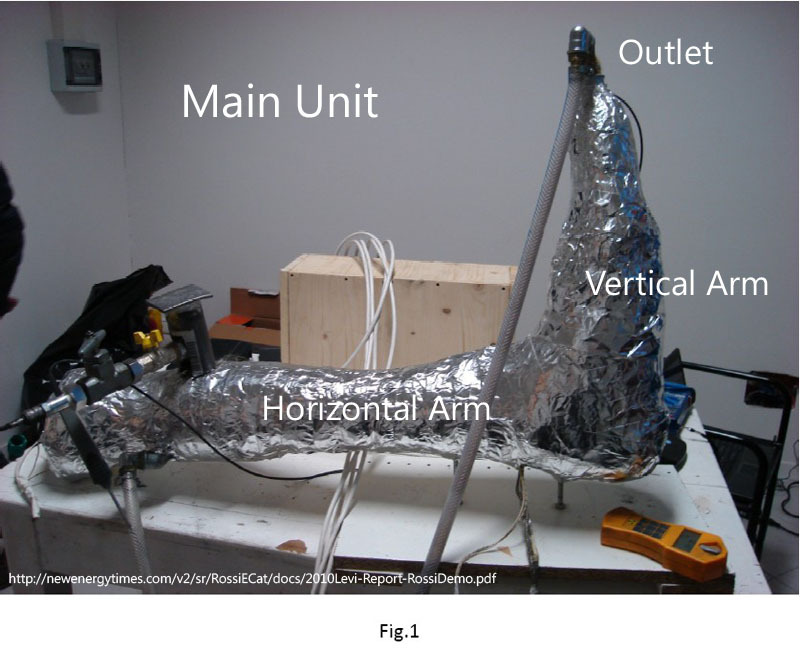 During the running we used the rightmost one of the devices, figure 4, which is surrounded by a 2 cm thick lead shield, as stated by Rossi, and wrapped with insulation, figure 5. We had free access to the heater electric supply, to the inlet water hose, to the outlet steam valve and water hose and to the hydrogen gas feed pipe. The total weight of the device was estimated to be around 4 kg. I read "As stated by Rossi" as "He said so and we believed him" -- not that "he previously stated it and we found it true when we inspected it". Discussion. Since we do not have access to the internal design of the central fuel container and no information on the external lead shielding and the cooling water system we can only make very general comments. Nor do they provide a photograph showing the insulation and the lead shield of the horizontal arm. There is therefore NO proof in the report that the wrapped, horizontal arm contains only equipment identical to the three unwrapped devices. They DID inspect the vertical arm by unwrapping the insulation (Fig 4), but did NOT inspect the inside of the "chimney". The complete horizontal arm and the vertical chimney therefore have to be included as "Fake". They did make one check which WOULD eliminate the Torelli fake (see below). However, they do not report that the visual check on the output tube was continuous. TODO: estimate the volume of the "steam outlet" section. The Control Unit was inspected. The pressure in the hydrogen bottle. The estimated pressure with which the reactor was charged. The mass of the eCat was reported as 4kg -- but it is not clear which parts are included. Note: the amount of hydrogen used was NOT measured. They ACCEPTED Rossi's statement that the central chamber was 50cc. The pressure and mass of hydrogen used could have been used to confirm the volume of the central chamber. The enthalpy from the chemical formation of nickel and hydrogen to nickel hydride is 4850 joule/mol . which is much lower than other candidates, so I have not used it in an "experiment". Because the horizontal arm was NOT inspected "unwrapped", we have to assume it contained FAKE material. The 6 hour test was NOT long enough to eliminate all of the fakes. 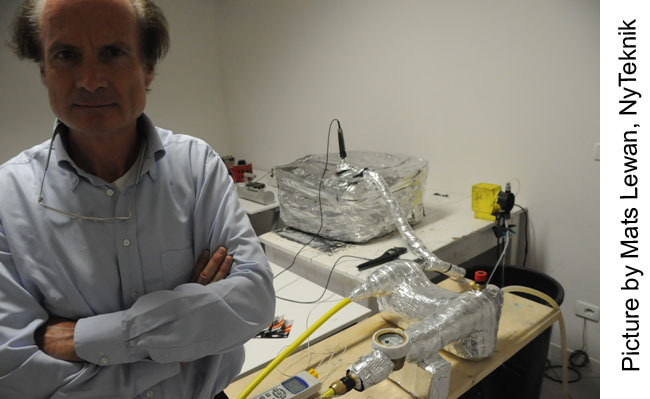 Two experiments were performed by Mats Lewan : Ny Teknik tested the energy catalyzer. In the first test on April 19, the national Italian television channel RAI was present and its reportage will be broadcast on the channel RAI News (live streaming here) Thursday, May 5th at 20:35. In the second test on April 28 only Ny Teknik, the inventor Andrea Rossi, and a colleague of his were present. Summary: They measured the weight of the input water and hydrogen, the voltage and amperage into the controller, and the input and output temperatures. The output temperature was measured inside the eCat. The April 19 test produced an excess power of 2.6 kW for 2.167 hours. The April 28 test produced 2.3kW for 2.97 hours. In the April 28 test they observed the output flow at all times, and condensed the output into a bucket. One must, of course, measuring the box as it is the total power input we are looking for. I and all the others before me have inspected the box inside. It contains no batteries or other energy source, just a bit of electronics and the most air. During the April 28 test, we also checked the steam flow through the outlet hose regularly. Some steam was reasonably being condensed back into water in the three-meter-long tube that was exposed to air and was thus at a slightly lower temperature, and a small amount of water was observed coming out of the hose. There is no evidence that they "unwrapped" the eCATs after the experiment, so for the purpose of this paper the entire body could have contained fake material. 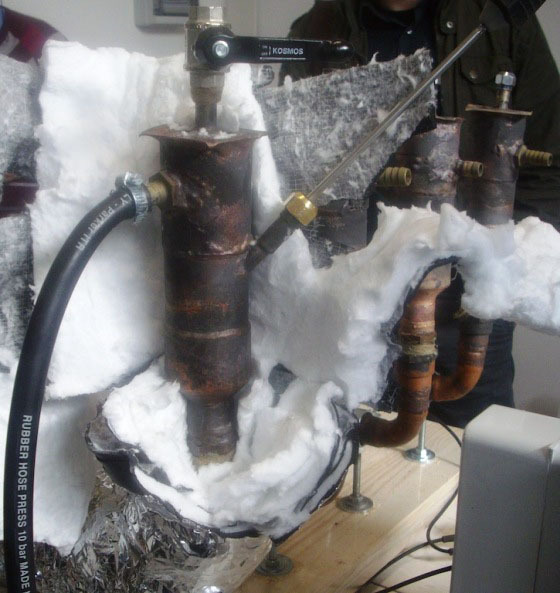 The dryness of the steam (only that the thermocouple was not under water). Hydrogen: 0.3 g of hydrogen was loaded. The experimental setup was adequate, but since the eCat was NOT unwrapped the time of the run was NOT long enough to rule out ANY of the chemical fakes. (Only some of the stored-heat fakes are eliminated). Mats Lewan of NyTeknik ran another test on a new Sep 2011 Experiment (according to Rossi, containing multiple reactors), which ran partly in self-sustaining mode. Again, this used the new "fatcat" first seen in the September test. This eCat DID run in self-sustained mode for an extended period. 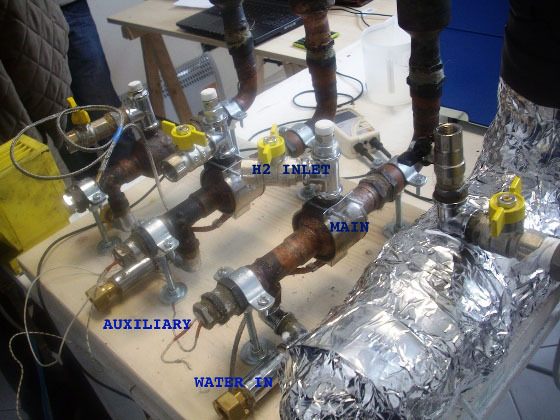 It was supposed to eliminate all questions about steam quality by passing the output of the eCat through a heat exchanger to a secondary circuit. From the flow rate and the temperature difference between the input and output (delta-T) the excess heat cacluation should have been unambiguous. Unfortunately, the thermocouple placement means that the output temperature could have been directly affected by the hot primary circuit. This is analyzed in a separate document Oct 6 2011 Experiment . Three tests were made, and reported in May 2103. The eCat consists of an outer cyclinder, 9 to 10 cm diameter and 33cm length, and an inner cylinder 3cm diameter and 33cm length. The input power is regulated by a controller (approximately 4 inches by 8 inches by 10 inches) and three high-power Triacs, each enclosed in a metal case with a visible grill. These are too small to supply any significant power for 100 hours, so they are ignored. The input AC power was measured with a wide-band meter between the power socket and the controller. DC power was not measured. This is a discussion in Swedish, which Google does a good job translating. Before you translate it, you will see that in the middle of it is a message from one of the authors, Torbjörn Hartman, in English. Here it is, with a few typos corrected. 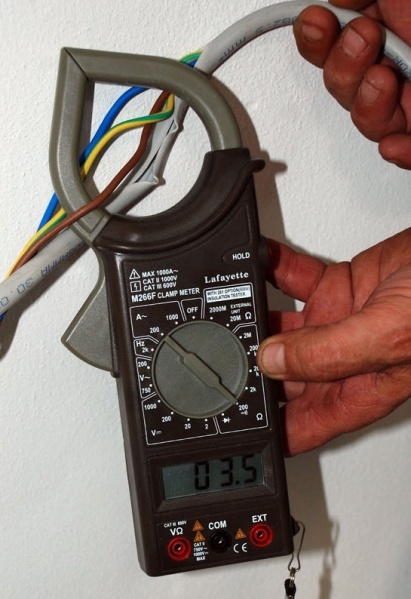 Remember that there were not only three clamps to measure the current on three phases but also four connectors to measure the voltage on the three phases and the zero/ground line. The protective ground line was not used and laid curled up on the bench. The only possibility to fool the power-meter then is to raise the DC voltage on all the four lines but that also means that the current must have an other way to leave the system and I tried to find such hidden connections when we were there. The control box had no connections through the wood on the table. All cables in and out were accounted for. The E-cat was just lying on the metal frame that was only free-standing on the floor with no cables going to it. The little socket, where the mains cables from the wall connector where connected with the cables to the box and where we had the clamps, was screwed to the wood of the bench but there was no screws going through the metal sheet under the bench. The sheet showed no marks on it under the interesting parts (or elsewhere as I remember it). Of course, if the white little socket was rigged inside and the metal screws was long enough to go just through the wood, touching the metal sheet underneath, then the bench itself could lead current. I do not remember if I actually checked the bench frame for cables connected to it but I probably did. However, I have a close-up picture of the socket and it looks normal and the screws appear to be of normal size. I also have pictures of all the connectors going to the powermeter and of the frame on the floor. I took a picture every day of the connectors and cables to the powermeter in case anyone would tamper with them when we were out. I lifted the control box to check what was under it and when doing so I tried to measure the weight and it is muck lighter than a car battery. The box itself has a weight, of course, and what is in it can not be much. All these observations take away a number of ways to tamper with our measurements but there can still be things that we "didn't think of" and that is the reason why we only can claim "indications of" and not "proof of" anomalous heat production. We must have more control over the whole situation before we can talk about proof. Interviewer: Have you tried to test the output of the power supply to exclude that also a DC current is supplied to the device, which clamp amperometers could not detect? Prof. Essén: No, we did not think of that. The power came from a normal wall socket and there did not seem to be any reason to suspect that it was manipulated in some special way. Now that the point is raised we can check this in future tests. In the present test, as a precautionary attitude, whatever was not known, not disclosed or not understood has been considered as the energy source. The duration of the tests would be directly proportional to the mass and volume of unknown origin. Presume that the ENTIRE unknown structure is made up of the Fake material. Make NO allowances for implementation efficiency. Make NO allowance for practicality (the material or combustion products might be fatally toxic: the required equipment would be impossibly small). Use the energy density (by weight or by volume) to determine the MAXIMUM energy content of the fake. Using the observed excess POWER (kW) of the system, determine how long you would have to run it to exhaust the energy. If that time is LESS than the observed run time, then the FAKE is eliminated. We also estimate the Fake's Feasibility (could it be made) and Concealability (could it escape immediate detection). For example, a fake powered by Batteries is both Feasible and Concealable. One powered by Diesel fuel is Feasible, but since its output fumes would instantly be noticed, it is not Concealable. Clearly this ranking is subjective, and would be different for different volumes. For "Unlimited Energy" methods the evaluation as a "black box" becomes more difficult, but generally requires more attention to closing loopholes. Make all measurements OUTSIDE of the eCAT, so that methods which involve water Diversion are eliminated. ... but see Rothwell's Razor, below. Anything which is not TESTED must be ruled in favor of the FAKE. If both the Volume AND the weight are known, then calculate the maximum run time for both, and use the LOWER number. These calculations assume that the experiment is run at constant power for the duration of the experiment, although during the February test there were reports that it produced 130 kW for short periods. In this case one would compare the total energy output of the fake and the measured values : it is not as easy to predict the time required to eliminate the fake. “You will not apply my precept,” he said, shaking his head. “How often have I said to you that when you have eliminated the impossible whatever remains, however improbable, must be the truth? First, we define the Equipment Sections, giving the weight and volume. Then we define various "Fake Materials" which could be used. The column headed "FC" represents an estimate of the Fake's Feasibility (could it be made) and Concealability (could it escape immediate detection). Finally, we construct "Experiments", in which we put various materials in the sections of the unit (presently fixed at three sections), note the POWER that the experiment produced, and the TIME it ran for. We calculate and add up the total ENERGY that the sections could contain, and calculate how long the FAKE could run at the observed POWER level. If the FAKE could run LONGER than the actual experiment, then it is NOT eliminated. If the FAKE only runs SHORTER than the actual experiment, then it is ELIMINATED. Villa reported the volume as 60 liters. In January Levi reported its weight as "a few kg". Villa reported the volume as 22 liters. Levi reported in February that much of the volume is insulation. Villa reported the volume as 9 liters. Levi reported in February that there are no hidden components. The mass of the reactor is 30 kg, and that most of that is lead. The volume of the Reactor CHAMBER is 1 liter, but did not give not the volume of the REACTOR as a whole. This section describes various techniques and materials which could be possibly used to construct a fake. The Wiki table gives the Energy Density for some materials, assuming that oxygen is obtained from an external source. If the oxidant also has to be stored, then the Energy Density is reduced in proportion to the mass or volume of the two components. These calculations are shown in a separate section. The materials selected represent the highest efficiency for any class. These all have the characteristic that they contain a fixed amount of energy, and can therefore only run for a limited time. A fake made from batteries or chemicals simply has to be run for long enough to exhaust the material. Batteries could be contained in the Control Box, and in the Main Unit. Lithium-Ion batteries are listed as the most efficient by volume. Lithium-Sodium batteries are listed as a higher Energy Density by Mass -- but the volume is not given. This method uses a Hydrogen Fuel Cell, which could deliver electric power from the Control Box to the Main Unit. It could use compressed or liquid Hydrogen, in conjunction with external air, compressed Oxygen or liquid oxygen. Comments : the by-product is water, which could be vented, or, if burned with oxygen, condensed and stored. This could be used in the main unit only. Comments : the by-product is water, which could be vented into the outlet, or, if burned with oxygen, condensed and stored. The Wiki Energy density table indicates that diesel has a slightly higher energy content than gasoline. Diesel or Gasoline would produce large quantities of fumes, which would be very hard to hide from observers. It might be possible to vent it into the steam outlet. This method uses Boron, burned with external air, compressed Oxygen or Liquid Oxygen, forming solid Boron Trioxide, which can remain in the unit. Boron is hard to ignite in air. Even in Oxygen it has to be raised to a high temperature. It is not clear whether non-toxic, glassy Boron Trioxide is formed by burning, or whether toxic BO and BO2 compounds are formed. It might only be feasible to burn powdered Boron : we assume that solid Boron is used. This method uses Aluminum, burned with external air, compressed Oxygen or Liquid Oxygen, forming oxides, which can remain in the unit. Aluminum is easier to ignite than Boron. Its energy density is less than Boron, so it would be easier to detect. As with Boron, it might only burn in powdered form. This method uses Beryllium, burned with external air, compressed Oxygen or Liquid Oxygen, forming oxides, which can remain in the unit. Beryllium is easier to ignite than Boron, but both Beryllium and its combustion products are extremely toxic. Magnesium combines with STEAM to produce Magnesium Oxide and Hydrogen. The hydrogen can then be burned with Air or Oxygen to produce water. An initial amount of water can be boiled using the internal resistors, and then the resultant steam can be recycled. One might expect that Explosives would contain a lot of energy. In fact, most of them do not. For instance, Nitroglycerine only contains 10 MJ/L, compared to Boron/External Air, which has 138 MJ/L. They just release their energy very quickly. Thermite has also been suggested, but its energy density of 10MJ/L is lower than other materials considered here, and it is hard to stop the reaction. These ABSORB energy when decompressed or evaporated. It is presumed that this is obtained from the ambient air. Rossi has indicated that the reactor chamber has to be re-charged every six months. A chemical reaction which can produce 10kW for 18 hours (let alone 6 months) would be as big a break-through in Chemistry as a LENR device would be in Physics. This section lists fakes which have been suggested by readers, but which have not yet been evaluated. Krzysztof Dydak : The reactor could contain Raney Nickel/air fuel cell fed with hydrazine dissolved in water with caustic. The entire volume is composed of a material with high specific heat. Beryllium and Iron are selected for their high specific heat values. Water and lead are included because they are known to be constituents of the main unit. Note : Dec 15, 2011 -- I need to add phase-change salts to this list. The upper temperature would be determined by the containing structure and/or heating apparatus. Note that the heat capacity might also explain "heat after death", when the output power continues after the inputs are turned off. This fake must be entirely contained in the main body of the apparatus. The upper temperatures are set to the boiling point of water, or for other materials, their melting point. The water which is pumped INTO the system is NOT all sent into the heat exchanger, but some is diverted into storage. The volume of the machine is much smaller than the 18 liters of water injected into it over the course of an hour. There is no place inside it to hide the water. The fact that it is a black box does not reduce the certainty of this particular factor in any way. He said he did not look at the end of the hose in the sink in the bathroom, but he did note that it was making a lot of noise from steam. I think any noise rules out the "diverted water stream" hypothesis. It is a distinct noise, after all, and a flow of 0.3 L per minute of warm water makes no noise at all at the end of the hose. For example, if the observed output power is 10 times the input power, and only 1/10 the water is converted to steam then the apparent output will be FAKE. It can run until the diverted 9/10 of the water fills the reservoir. As an UPPER limit, presume that the ENTIRE flow is diverted. (The actual required diversion is related to the power factor). 31.00 17.50 1.77 0.50 FAKE? 14.73 3.80 3.88 2.97 FAKE? For each type of fake, various "experiments" are defined, with individual sections loaded with fake materials. The January Power and Duration, with the Main Unit filled with fake material. Levi's statement that the control box "weighed a few kg" and therefore cannot contain fake material, is accepted. The February Power and Duration, with the Horizontal Arm filled with fake material. Levi's statements about the control box and the vertical arm are accepted. The February Power and Duration, with an ESTIMATE of the volume of the whole reactor. The March Power and Duration, with the Horizontal Arm filled with fake material. The March Power and Duration, with an ESTIMATE of the volume of the whole reactor. The March 2013 Power and Duration, with the MEASURED volume of the inner and outer cylinders. Controller contains a Hydrogen Fuel Cell, Main unit burns Hydrogen. Liquid Hydrogen and external Air are the most favorable for a fake. Controller contains a Hydrogen Fuel Cell, Main unit burns Diesel. For both, external Air is the most favorable for a fake. Controller contains a Hydrogen Fuel Cell (Liquid Hydrogen/Air), Main unit burns Boron with Air. Controller contains a Hydrogen Fuel Cell (Liquid Hydrogen/Air), Main unit burns Boron with Compressed Oxygen. Controller contains a Hydrogen Fuel Cell (Liquid Hydrogen/Air), Main unit burns Boron with Liquid Oxygen. Controller contains a Hydrogen Fuel Cell (Liquid Hydrogen/Air), Main unit burns Magnesium in Steam, producing Hydrogen, which is burned with external Air. The entire volume of the main unit is a water heat sink. Note that this cannot BOIL the water for the January experiment. The entire volume of the main unit is a Beryllium Heat Sink ... pre-heated to its melting point. The entire volume of the main unit is an Iron Heat Sink ... pre-heated to its melting point. The entire volume of the main unit is an Lead Heat Sink ... pre-heated to its melting point. This section lists the most plausible (Feasability,Concealability) fake for each experiment. This section lists the longest-running fake (ignoring Feasability,Concealability) for each experiment. At present we have no independent measurements of the weight of the various parts of the eCat. These have the characteristic that they can run for an unlimited time. Instead of calculating how long they could run, one has to calculate what is is needed to produce the observed power. "The temperature and 'air quality' measurements were taken INSIDE the reactor, (in holes prepared by Rossi) instead at its final output. Nobody could see inside the reactor so there are a lot of possibility. One possibility I thought is that an amount of the water flow have been diverted. One part of the water flow actually goes inside the "hot core", heats and became vapour and another part simply bypass everything in another internal pipe and go directly to the output where it is re-mixed with the first part. Nobody measured the output steam flow or its speed (should be around 74 m/s for 5 g/s flow!!!) The electric power input was sufficient to vaporize the fraction of the water flow that goes into the core and that is measured. With a divertor commanded by a simply thermo-sensor, all can you see from outside is a behaviour like a start of internal energy generation insted it's only the start of a flow fractioning. All this consideration is independent from the honesty of Rossi, there is this possibility so it has to be denied by a new measure (possibly without steam production)." I do not know if the holes were prepared by Rossi. Anyway, this method would call for a complex set of hidden remote controls, to accommodate observations such as the one that the temperature was higher when input power was reduced from 1000 W to 400 W.
You might also have an electrically heated water outlet hose, heated on outside, and ask people to touch this as added confirmation that water is really hot. This is a very serious "unlimited energy" fake. It would possibly not have been detected by the January experiment or the February experiment. ALL of the measurements in ALL of the experiments were done via the instrument port in the chimney, and would only have measured the temperature and steam dryness in the outer compartment. 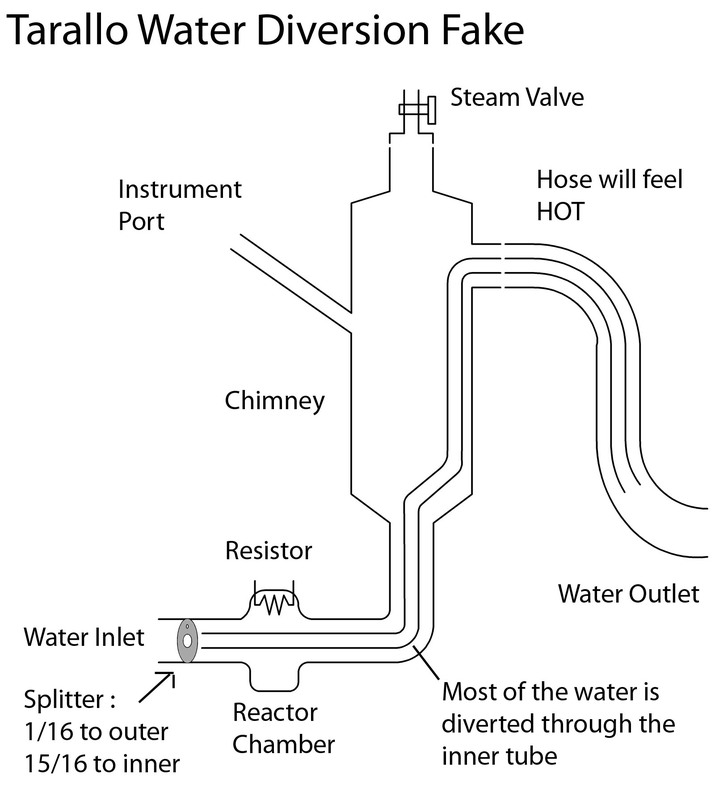 The water sent through the "reactor chamber" is simply heated by a resistor, powered from the control box. The observed "temperature profiles" could easily be accomplished by changing the power sent to the resistor: the connection between the control box and the main unit was NOT measured. The power loss from the outer HOT section to the inner COLD section is estimated to be about 80W (for a rubber tube 2 cm outer diameter, 1cm inner diameter). This loss would be hidden by diverting more water from the outer to the inner tube, and could be further reduced by the use of insulation. Jacques Dufour also attended the demonstration. He does not speak much Italian, so he could not follow the discussion. He made some observations, including one that I consider important, namely that the outlet pipe was far too hot to touch. That means the temperature of it was over 70°C. Celani did not see the steam emerge from the end of the pipe, but he reported the whistling sound of steam passing through the pipe. (Dufour did not notice that but he says he is hard of hearing, especially high frequency sounds.) I think there is no question the water boiled, and much of it was vaporized, so there was massive excess heat. To the right at the chimney, a black hose of heavy rubber, for high temperatures, carries the hot water/steam to the sink on the wall of the adjacent room. ..... We had free access to the heater electric supply, to the inlet water hose, to the outlet steam valve and water hose and to the hydrogen gas feed pipe. The following was presumably done through either the instrument port or the steam valve -- both of which connect to the OUTER (hot) section of the Torelli fake. Between 11:00 and 12:00 o’clock, control measurements were done on how much water that had not evaporated. The system to measure the non-evaporated water was a certified Testo System, Testo 650, with a probe guaranteed to resist up to 550°C. If this visual check was made at the sink in the "adjacent room" then it WOULD eliminate the Tarallo fake. ... and the valve letting out steam from the chimney. Future experiments : all measurements must be conducted OUTSIDE of the Rossi Device, not through the "instrument port". It has been suggested that hidden wires could have provided the observed power (Rothwell: Hidden wire hypothesis redux). This can only be eliminated by inspecting the apparatus. Similarly, a small tube could supply gas to the unit (Rothwell: Vortex List) --- although other methods might detect this (change of weight, imbalance between input and output volumes). We also controlled all other equipment and checked that there were no hidden connections from the floor or walls. To safely exclude the transfer of external wireless energy, we measured electromagnetic fields from 5 Hz to 3 GHz. No increase could be noted except for a slight increase at the power-grid frequency of 50 Hz, close to the electrical resistor positioned around the reactor. Ian Bryce of the Australian Skeptics Society has published a report in which he proposes that SOME of the tests could have been faked by sending current through the neutral wire. Bryce found that in all six published tests up to July, a misconnected earth lead could funnel in up to 3 kilowatts, thus bypassing the power meters used, and accounting for all the measured output power in the form of steam. In all later tests, there was no valid power measurement due to poorly placed thermometers. This analysis is based in part on Krivit's photograph, and comments by Lewan that that he did not check all the wires in his early test. 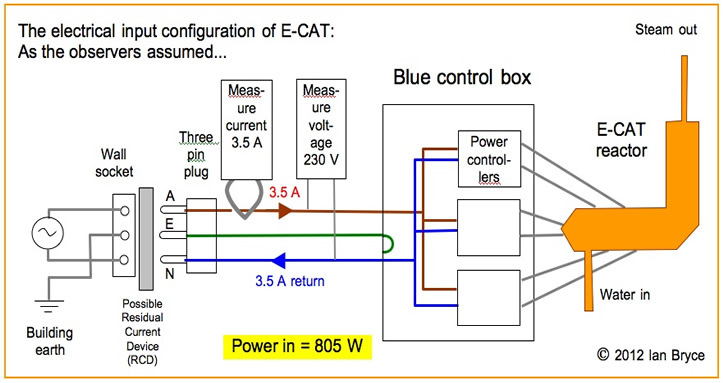 (In Lewan's September 2011 test he measured the power on the pair of wires going into the eCat). Levi does not specifically record whether power was measured on all the wires, and the Watts-Up meter might be confused by this type of miswiring. For the remaining tests, Bryce relies on the well-reported calorimetric deficiencies. There is another "power meter" fake (See Gibbs articles?) which involves a more complicated wiring fake. These eliminate any possibility of the proposed wiring fakes in those experiments. Since the flow wasn't monitored continually, the water intake could have been cut off or reduced. Dr D R Jones : Now if this is simply a hoax then it would have been relatively simple to carry out given the observations above. 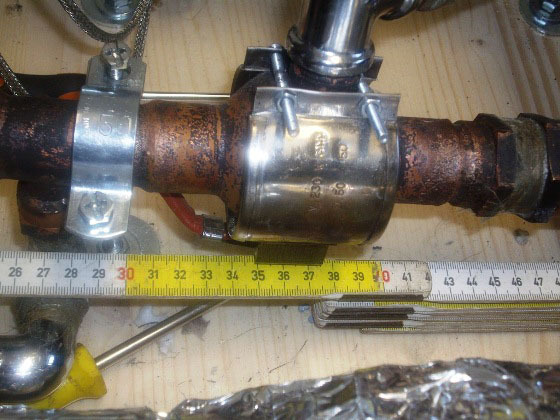 Instead of an internal heater, substitute a water flow valve (the wires are in the correct place). Let the external 300W heater heat the initial water flow up to 60 Celsius – then get peoples attention by stating that they should watch the computer as the reaction is initializing – then simply close the flow valve so that the water flow is greatly reduced – the insulated device and the 300W external resistor will do the rest. Thus the question to be asked – did either Essen or Kullander monitor the water flow during this transition from flowing water to steam generation? Further it would be interesting to know if water can flow through the "chimney" of the reactor directly into the black tube. To figure out what is going on one have to add a substance (dye) to the water and see if the dye can be seen in the " condensed" water. If non vaporised water is carried to the end of the black tube this will have consequences for the calculation of excess heat. To be sure, McKubre and others have pointed out that the outlet thermocouple position is not ideal, and it might be picking up some heat from another path. This may be happening to some extent. It might even be measurable. But it can be shown that other paths are minor compared to the flow of water. A high-frequency or phase component on the power input could give a false power reading. Solution: monitor the input voltage and current with an oscilloscope. However, since the control wires cannot handle the required 12kW a false reading wouldn't affect the result. The water supply is not, in fact, water, but a combustible liquid which looks like water. In the category of clear water-based liquids which burn cleanly enough to be used indoors, and which could be confused with water in a testing arrangement (since it would be so unexpected as the 'trick' used to pull-off the deception) - there are several choices. These are miscible and with 40-50% water and the resultant blend would be combustible at that dilution level - would go undetected by a group of observers who assumed that it was water. All of these ingredients would be expected to be legitimately found in any company which produces or evaluates alternative fuels - and if the ruse was discovered prematurely . "oops, Igor, you brought in the wrong container," or else "yes, our municipal water is very polluted here". Hydrogen peroxide produces only steam. HOOH is more viscous than water, but appears colorless in solution. It is both an oxidant an a propellant. When used in a blend, it would provide free oxygen and steam, so that air is not needed to combust the other ingredients (or less is needed). Jones Beene: The pump's power must be included in P-in. A liter/sec pump seems to require one horsepower or about .75 kW. Robin van Spaandonk: If we assume 100 psi for the mains pressure, then a flow rate of 1 L /s equates to a total power of 724 W, assuming all the power in the water gets used. This would raise the temperature of that water by 0.173 ºC, so it would at most make a 4% difference, even if it were all included. Jones Beene: Allow me to apply reductio ad absurdum to this situation. Let's say Rossi shows up with a reactor that puts out one megawatt of heat. It requires a large flow of water, which is coming from a local dam and goes into a sewer. This new reactor requires no electrical input at all !! The heat is measured by a thermal circuit that removes heat from the stainless steel reactor, and the new owners of this magical device use it to heat the factory. It remains warm all year without any electricity ! Let's say the device is opened up and found to contain nothing but flow constrictors - which convert water pressure into heat via friction - nothing else. Is Rossi entitled to claim that the megawatt of heat is "overunity" and therefore free energy ? However, this discussion did lead to another proposal for a "real" energy catalyzer: see "Magnetostriction and Cavitation". These would pass all calorimetric tests and inspections. They should therefore be regarded not as fakes, but alternative explanations of the source of energy. One gram of Plutonium 238 generates approximately 0.5 watts of power. To produce 10 kW of power one would need 5.00 kg of Pu 238. Since 1993, all of the plutonium-238 the U.S. has used in space probes has been purchased from Russia. 16.5 kilograms in total have been purchased. For the proposed 1 MW unit, one needs 500.00 kg -- more than was acquired by NASA. Note : the Wiki Energy Density value is very high : it is probably the total energy emitted until the Plutonium is effectively depleted. KitemanSA on the polywell forum. suggested that a heat pump could have provided the observed power. If these numbers are true, then even with a perfect heat pump, the output power (given max Coefficient of Performance and 80W input) could only be ~4.6kW. So unless there is significant measurement error or fraud, this isn't a heat pump device either. if the room was at typical room temperature, which is ~21 ºC, the theoretical CoP would be infinite, so it COULD be a fancy heat pump. The January experiment would have needed a CoP of 31, and the February experiment would need 200. The last two are below the theoretical limits of a Carnot cycle, so they cannot be excluded on theoretical grounds. A theoretical, infinite-CoP heat pump could probably only be ruled out by enclosing the entire Main Unit in a calorimeter. If this were filled with Nitrogen, it would also rule out any method using Air as a fuel. Again, we come to the distinction between "not noticed" and "not checked" (none of the reports mention the surface temperature of the eCat).A 12kW heat pump would surely result in a "cold" feel to the surface of the the eCat, if not the room. A 2.4kW heat pump : not so obvious. The Hydro-Dynamics pump employed cavitation and shock waves from a dimpled rotor spinning inside a housing to increase the temperature of water flowing through the device. It was tested on a number of occasions to be OU, but not reliably. Jed Rothwell has reported on it, as did Infinite Energy. Now - imagine the rotor being non-rotating ! Cavitation in the Rossi device could be described as Griggs pump - with the reactor substituted for the dimpled rotor. The reactor cavitates violently, but at low excursion, and would not be noticed in a demo, since the effects are dampened by the water flow. Primarily, it produces cavitation INSIDE the cell, and ironically this would never have been noticed outside the cell except for contrasting the two tests in Bologna, one with low water flow, and one with high. This could be a most fortuitous discovery for anyone working on a replication. The reactor containing the nanopowder would function like a humming transformer core and it could also operate internally with shock waves pushing hydrogen into Casimir cavities. As in the Griggs pump, cavitation generates shock waves which convert mechanical energy into acceleration and eventually into heat energy - in a way that is gainful at times. The Rossi reactor is apparently gainful all of the time, and that could be due to the employment of nano geometry. Many of the common transducers used for sonochemistry are magnetostrictive instead of piezoelectric, as these are more robust at high input. The efficiency is very high. It is too much of a coincidence that the reactor loses it heating effect at a temperature which coincides with the Curie point of nickel, and is more robust when more heat is removed by higher water flow; not to mention that the "resistors" have a magnetic field. An interesting point is that the inventor may have discovered this inadvertently and never thought to optimize the input power, which should be easier to do via an inductive coil instead of resistance heaters. ... the razor is a principle that suggests we should tend towards simpler theories ... until we can trade some simplicity for increased explanatory power. Contrary to the popular summary, the simplest available theory is sometimes a less accurate explanation. It is very tempting to propose elaborate schemes by which a fake eCat could be detected. For instance, in the author's physorg.com posts he suggested feeding it a brew of various isotopes of water to make sure that the SAME water goes in and comes out. This is my point, there may be a million things you haven't thought of. Nope. That does not work. A good experiment cannot have a million possible problems. If we had to think up a million ways that an experiment might be wrong (or fake -- pretty much the same thing) then no experiment would ever prove anything, and there would be no progress. A bad experiment can have a large number of possible errors (or ways to make it fake). Flow calorimetry experiments similar to this, with boiling water or flowing water, have been done many times. The potential errors are well understood and their number is strictly limited -- unless you are aiming for the kind of precision SRI achieved. In an experiment with only 4 main parameters -- input power, inlet temperature, outlet temperature and flow rate -- the number of potential significant errors will [be] small, and so will the number of ways deliberately fake data can be surreptitiously introduced. When the method is complicated, and the results close to the margin, with many parameters with, for example, the possibility of recombination producing a significant error, then there are many ways an error can creep in, and many ways to deliberately introduce fake data. Complexity and a low s/n ratio invite error, misinterpretation or fraud. Since the December/January experiments only recorded the inputs and outputs for a short time (30 minutes), almost ANY of the fakes could have produced the result. For the February experiment Levi was allowed to inspect everything, EXCLUDING only the 1-liter reactor chamber. If you accept all of Levi's February report, then all chemical fakes are conclusively ruled out. Neither the January or February reports rule out a Tarallo Water Diversion Fake. The March report DOES rule out a Tarallo fake -- but since the Horizontal arm was NOT unwrapped, it does NOT rule out all chemical fakes. The April experimental setup was adequate (although the dryness of the steam was not measured) and DOES rule out a Tarallo fake. Since the eCat was NOT unwrapped the 2.9 hour run was NOT long enough to rule out ANY of the chemical fakes. (Only some of the stored-heat fakes are eliminated). The April test does not even rule out a simple Water Storage fake. Since the January-February and March-April tests use different versions of the eCAT it is not obvious that their results can be directly combined. Experiments producing steam are more susceptable to measurement errors, and the output water volume has not been reliably recorded. ... and improbable as it is, all other explanations are more improbable still. Therefore, at present, we cannot conclusively rule out ALL possible fakes from any one experiment, and the variations in experiments do not allow them to be directly combined, so it is not yet PROVED that the Rossi device is real. It must, however be noted that Rossi made the "Calorimetric Black Box" eCAT available without any restrictions (other than the use of radioactive spectral detectors), so the lack of proof is due to defects in the observers instruments or techniques. This paper considers UPPER BOUNDS for what a Fake could achieve. Any actual fake would run into engineering difficulties long before those limits were reached. When designing a machine for propulsion or for electricity, thermodynamics is your enemy. The heat of friction, for instance, robs your output. But if your machine is simply heating water, then thermodynamics is your friend, or at least neutral. But the limits of thermal efficiency are not THAT far off 100% : for instance, modern gas furnaces have an efficiency of over 95% (Furnaces and Boilers). Nor is the assumption that 100% of the weight or volume is fuel : advanced rockets such as the Proton UR-500 have a 95.6% fuel-to-dry-weight factor. So any discussion of "implementation" is quibbling over less than 5%! This must also be observed with an oscilloscope to ensure there is no high frequency/phase component which could confuse a simple power meter. Monitor ALL the power wires at all times to eliminate the Bryce and similar fakes. As much as possible of the unit should be open to inspection to reduce the volumes (or weights) in which fake material could be hidden, and thus shorten the time needed to eliminate fakes. Thanks to Jed Rothwell and others too numerous to name on the "Vortex" mailing list for information, corrections and comments.